He’s sad. He’s mournful. He’s remorseful. He is fully aware of what is going on, and he’s just a broken human being. Is this an overload of compassion for someone who does not deserve it? Well, it may be. Apparently the Public Defender is an extreme liberal person. However, Let’s set this matter aside for now, because this is not really important to this story. It is not an excuse for anyone to say “the devil made me do it.” This is not up for debate, and it would even appear that Cruz himself knows this. But this is also the seventeenth school shooting in 2018 alone, a number more than twice as high as the same time last year, and the highest number this early in Everytown Research’s tracking of school shootings since 2013. This same research group notes that the number of school shootings per year in the research period has ranged between 37 and 65 per year, for a total of 291 shooting incidents since 2013. Debate about this serious problem usually goes to the rather careworn theme of gun control in the United States, with various media agencies seizing on the grief of the moment to capitalize on their political opinion, and other media outlets trying to also seize on the same moment to oppose the notion of ripping away the Second Amendment. He is much closer to the problem, and of course, attention is gradually increasing regarding the matter of psychotropic medications that are turning out to be associated with bizarre and deadly behavior on the part of those taking such medications, for depression or other “mental health” issues. The ancients and the Jewish, and later, Christian elders, associated this bizarre behavior of people to demonic affliction, attack, and even in some cases, possession. There are many stories of Jesus, his disciples, and later elders all the way to today conducting exorcisms, driving out demons from afflicted people. I have been witness to such people, (yes, possessed people, and their ongoing exorcisms) myself, and I will only say their behavior is indeed bizarre. But in all these cases in history the cure was God-reliant – that is, people were able to affect a cure for the afflicted person through prayer, fasting, the experienced care of a priest or elder who was spiritually strong enough to take on this very difficult task. Demons do not fight nice, and even to this day the number of true exorcists is quite low, because only a few ordained clergy are considered to be up to the task of this sort of spiritual combat. But more recently, this issue of mental and psychological disturbance and its treatment began being conducted in a manner that completely discounts the spiritual-corporal unity, and it has now become an issue solely of altering brain chemistry. While it is important to consider that even in ancient history it was not believed that all cases of mental illness were attributable to demonic forces, there were still some cases where a patient did not respond to any known form of physical treatment, and the court of last resort was to seek a Power that was not within our synthetic reach. 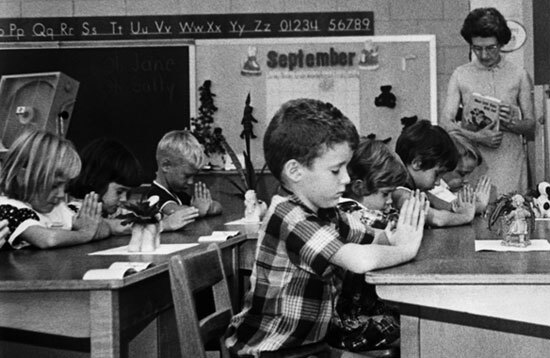 Children praying in school before 1962’s Supreme Court decision took that right away. One of the recent events in American society and culture has been the discouragement and even banishment of any reference to God (most particularly the Christian framework regarding God) from public life, from the study of history and culture, from the arts, from legal interpretation, and more. In 1962, the US Supreme Court decided that prayer in the public school violated the First Amendment by constituting an establishment of religion. In 1963, for the same reason, Bible reading in public schools was disallowed. Now, this did not mean that prayer in public school stopped right away. I remember it in the 1970’s in my grade school years. But it did stop, and the face of American civil society began to change. Over fifty years have passed, and with it the social norms have flipped almost diametrically opposite to what was upheld as ideal in the early 1960’s. Tolerance for any religious view but Christianity became increasingly reported through all this time, but most notably the pace quickened after 2008. At the same time, the US mental illness disability rate has risen, from 1 in 184 Americans in 1987, to 1 in every 76 by 2007. In 2017, the prevalance rate is now almost one in five. That is near 20% folks, up from about one-half of one percent thirty years ago. It would be easy to pass this off as anything from data manipulation by greedy pharmaceutical companies to honestly increased acceptance and exposure of problems everyone already had but never talked about. But an honest examination of these stats is stunning. Something has happened, and most of us can see it, or even experience it, ourselves. Something underlying who we are as a nation and as a people has been taken away, and as the result something else has replaced it, hiding in plain sight, whilst the debate rages about things that do not really matter. Guns do not kill people without some person picking them up and using them. This is not a Second Amendment screed. Guns are simply lifeless things, and if no one pulls the trigger, they very rarely fire. Families were taught gun safety as a normative rule, especially in rural places, There were simple rules we were taught, like “there is no such thing as an unloaded gun”, “never point a gun at someone”, and more, and kids everywhere knew that their parents had guns locked in a cabinet, and in many cases, guns were out in the open, but never touched. Kids had the fear of God in them to ever go near the rifle sitting openly on the gun rack in the living room. But now, things are different. The guns did not change, though. It was us. Now, there is no fear of God. It got removed. And even the religious among us in the USA struggle with the reality of our chosen religious beliefs. While many churches are full of people, the notion of serving God by doing what He prescribes is curiously absent, though many of us do not believe this. This problem, oddly enough, is very difficult even for clergy to see. Once, in Colorado, a priest I spoke to realized with shock that the Church was losing ground there. It was a shock to the priest because his own zeal for the faith was very strong, and he could not understand the reality that it was not shared by everyone in Church. We often associate church attendance with zeal for the faith, but that is not a reliable measure. America is fundamentally a nation shaped by Protestant / English values, and this cultural norm places a heavy emphasis on “appearance” rather than “obedience.” A “good Christian” therefore is one who goes to Church dressed nicely. What a person does in regards to their own salvation is never considered, because simply by the act of going to church, he has shown his virtue and nothing more is required. God is no longer taught as the Authority of Creation, its Creator; rather the message is subtly altered to “God wants YOU to be wealthy, prosperous; God is with you to help you get whatever you want in life.” And this is a very popular message in a country blessed with plenty. This has made the issue of “belief in God” (which is far different than actual faith in him) an issue where a statistically large percentage of Americans say “Yes! I believe in God.” But when it comes to the question “Do you strive to do His will?”, it would be probable that this question itself never even makes it to the table. For decades now, even in very traditionally-based faith groups in the United States, the emphasis has been on what God will or will not do to give us what we want, and scant little about reliance and obedience to Him in the face of all of life’s problems. So, when Nikolas Cruz says that voices in his head told him how to carry out this attack, I cannot reasonably say that this is a lie. God has been rejected, wholesale. But history shows us over and over that human forces and nature are not the only Powers in the world, and history has also shown us that nations who refuse to follow God, fail. It may not happen this exact moment, but it does happen. In 55 years, America has flipped on its head, from a nation that considered God its King to something very different. And it has often been theologically held that hell is the place where God is absent. When he is made absent by our wishes, he goes, but his absence is not left vacant. Other powers are only too gleeful to fill the void. No nation or empire that goes away from fundamental truths survives unless it returns to those truths. The absolutely tragic events in Florida and elsewhere bear witness to this fact, and the souls of the innocents slain in the demonic rage of their killers bear witness to this fact. This may be a very unpleasant truth to face, but facing it and changing, may save our people and our land.